I absolutely love Mt. Rushmore lists. They’re fun, easy-to-understand versions of the “Top X” list, but they remove the specific 1st, 2nd, etc. ranking minutiae that can bog things down. It’s just your top four picks, in no specific order. It’s simple, beautiful, and even patriotic. If you want my take on the best four things from any group of things, this is how you get it. Recently, I was listening to an episode of the Ringer’s “Rewatchables” podcast about “The Natural” and how incredible it is. As part of the conversation, the host named The Natural as part of his Mt. Rushmore of baseball movies. Excited and motivated, I decided to hash out my own Mt. Rushmore of baseball movies. But First, a confession: Despite being a massive baseball fan and avid movie watcher, there are several well-loved baseball movies that I’ve never seen. And a few of them would certainly be included on someone else’s Mt. Rushmore, but not mine. Perhaps I’ll sit down and watch a few of these some day and rethink my picks, just not today. These are baseball films I haven’t seen: Pride of the Yankees, Bang the Drum Slowly, The Bingo Long Traveling All-Stars & Motor Kings, Take Me Out to the Ballgame, Damn Yankees, Sugar, Fever Pitch, Fear Strikes Out, Mr. 3000, 61*, Mr. Baseball, Cobb, Summer Catch, and The Phenom. Additionally, there are many baseball movies that I have seen–with mixed results–that all fall short of my Mt. Rushmore. However, these movies are (mostly) all worth watching, and I’m going to share my thoughts about them in the hope that if you haven’t seen one, you might be inspired to track it down for your own viewing pleasure. Note: I’m only going to cover fictional movies, but documentaries like Ken Burn’s Baseball, or Fastball / Knuckleball / Curveball are all wonderful and should be watched. There are a few movies that frame baseball as a comedy, full of slapstick and spoofs of clichés from the sport. Obviously, the first one that comes to mind is Major League and its sequels (1989, 1994, 1998). Declining in genuine laughs and charm as the series progresses, this three-picture franchise depicts the Cleveland Indians continuously struggling to win. It’s full of solid jokes, classic performances, and more than a few iconic lines that are “just a bit outside” of modern relevance. As a relic from the politically-incorrect 70’s, The Bad News Bears (1976) offers a dark comedy about an alcoholic played by Walter Matthau who gets stuck managing a terrible baseball team of misfit children. If you enjoy displays of outdated humor, emotional abuse, and I-can’t-believe-this-used-to-be-okay drunk driving a convertible overflowing with kids, this is your jam. Haled as a semi-sequel to Dazed and Confused, Everybody Wants Some!! (2016) follows a collection of college baseball players as they navigate practice, games, and parties. It’s a fun movie but minimizes actual baseball in favor of the team hijinks and sexual misadventures, so set your expectations accordingly. The ‘90s spawned a trio of kid-themed baseball movies that I remember fondly. Rookie of the Year (1993) follows a teen boy whose broken arm heals too tight (not a thing) granting him the ability to throw a high-end fastball and join an MLB team overnight. It’s ludicrous, but fun to watch as he gets into and out of trouble in the majors as a result. Injecting a heavy dose of faith in to baseball, Angels in the Outfield (1994) tells a story of literal angels helping the Los Angeles Angels (or whatever they’re called) make extraordinary plays in the outfield. I remember it being fun, but now that I’m thinking about it, what even is this movie? Remember the arm/wings flapping thing everyone did in the stands? There’s no chance this even gets made today. Lastly, Little Big League (1994) shows us what would happen if the owner of the Minnesota Twins died and left full control of the team to his mega-fan grandson. Somehow knowing the team better than any of his adult counterparts, this (annoying at times) kid manages the ballclub for the rest of the season, using a few unconventional methods to inspire a push toward the playoffs. If that sounds like it’s in your strike zone, take a swing. Baseball loves an inspirational story, carried by a central protagonist contending with a series of obstacles on their path toward self-discovery. First up, Disney’s The Rookie (2002) starring Dennis Quaid as a school teacher following a life-long dream to pitch in the majors. Not dissimilar from another of Disney’s older-guy-can-still-do-sports genre, Invincible, this movie has all the trappings you’d expect–including a freeze-frame ending with text telling us about the real life it’s based upon. Depicting the integration of Jackie Robinson into the MLB, 42 (2013) has more to say than its compact title would suggest. While overt in its simplistic presentation of the racial politics of its time, the movie benefits from a wonderful performance by Chadwick Boseman and several defining moments from Robinson’s iconic career. Lastly, A League of Their Own (1992) offers an ahead-of-its-time tale of two competitive sisters following their shared dream of playing professional baseball during World War II when there weren’t enough non-enlisted men to sustain a league. Anchored equally by laughing and crying (in Baseball!? ), it holds up under our contemporary #MeToo / #TimesUp movements. Differentiating themselves from the inspirational baseball films, the dramatic ones aren’t concerned with leaving viewers with a positive takeaway, but rather a “realistic” depiction of the game’s varied emotions. I haven’t seen John Goodman’s The Babe (1992) in decades, but I remember it warmly. Although, I think the titular performance single-handedly cast Ruth as an imposing and intimidating figure in my mind. Probably accurate to Ruth’s real persona. Eight Men Out (1988) successfully delivers a complex movie about the 1919 White Sox throwing the World Series and being condemned to a life of shame. The stellar cast elevates a decent script, resulting in a quality movie-watching experience. It’s not perfect, but it’s worth watching for the nuanced history lesson if nothing else. For Love of the Game (1999) balances a baseball story of a pitcher, played by Kevin Costner, working his way through a perfect game against a romantic tale of the love behind the man on the mound. The baseball scenes work wonderfully, with the great John C. Reilly shining from behind the plate, but the off-field story falls a little flat for me. Lastly, and probably the movie on most people’s Mt. Rushmore is Bull Durham (1988). Costner’s second Baseball movie on this list (but not his last!) finds him as a seasoned veteran in the minors catching a hotshot rookie played by Tim Robinson. Complicating their season, Susan Sarandon glows as a local bent on bedding the young stud and experienced gent equally, forming an explosive love triangle. It’s funny, fun, and showcases some genuinely terrific baseball scenes. You’ve probably already seen it but see it again anyway. At last, we’ve arrived at my Mt. Rushmore of baseball movies. I’m heavily influenced by various factors, like when I saw the movie, who I was with, what my life was like at the time—and on and on. But my top four baseball movies are all spectacular in their own rights. I’d guess that by now, you have a few of them figured out, but maybe not. Let’s find out. The movie standing on the first base of my Mt. Rushmore is no surprise–I did namecheck it in the intro. The Natural (1984) is the definition of a classic hero sports story. It’s beautifully shot, fully realizing its 1930s setting with soft lighting and a romantic golden touch. The story follows the mythic tale of Robert Redford’s Roy Hobbs, a would-be baseball great overcoming an early career trauma to make an earnest attempt at baseball glory and redemption. The lean script allows each word to carry significance, while the epic score enhances everything from a multi-game losing streak montage (“syphilis!”) to arguably the most triumphant cinema finale of all time. Sliding into second base is a movie for kids, that isn’t for kids at all, The Sandlot (1993). At first glance it might appear as though The Sandlot is yet another of the 90s kid-themed baseball movies I discussed earlier, but I believe it stands apart. Where those others fail (in comparison) is in their setting. All three integrate child characters into the MLB (owner, pitcher, diehard fan), which is fun to imagine, but entirely impossible. However, The Sandlot centers its story on a neighborhood dirt ballfield that practically everyone has played on at some point. The young actors are all fantastic in their own ways, exuding genuine chemistry and charm as they solve the mystery of “The Beast” behind the centerfield wall. 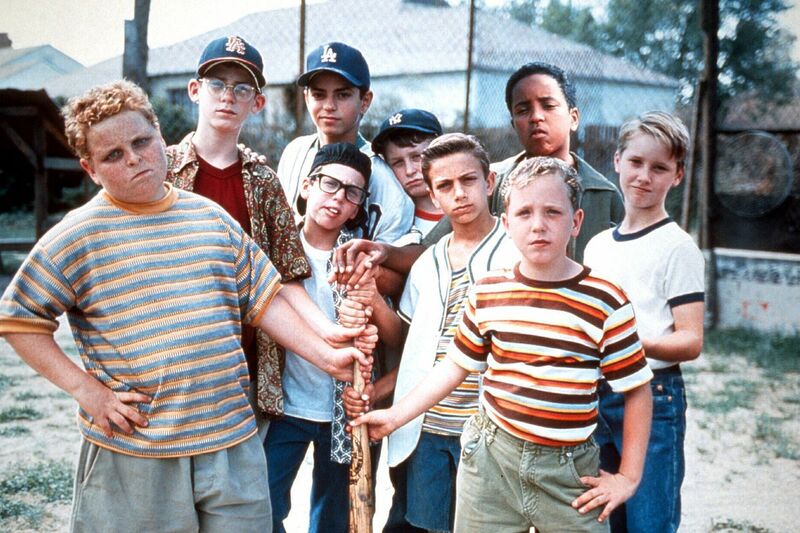 No movie conjures the feelings of summer baseball like The Sandlot. Stretching out an appropriate triple, Kevin Costner’s Field of Dreams (1989), perfectly balances the romantic lore of baseball’s past with the search for meaning in modern America. Its story is utterly supernatural–weaving in elements of prophecy, god, heaven, and the legacy of truly legendary baseball players. Beyond the wonderful cast all pulling their weight, the power of this film is how well it captures and presents the indescribable magic of baseball. Starting with the iconic “If you build it, he will come.” Line, to the haunting image of players walking out of corn rows onto a homemade baseball field, to ending on the final image of headlights stretching for miles into the distance, this celebrated film relentlessly tugs on your heart strings. Crushing one to deep center to walk-off the game is the 21st century masterpiece, Moneyball (2011). Oh man, this movie gets so many things right. The cast is stellar, with Brad Pitt and Jonah Hill leading the way, but also including smaller, terrific performances from Chris Pratt, Philip Seymour Hoffman, Robin Wright, and others. The story is unique among other romantic or heroic baseball movies, as it’s set in the early 2000s, following an Oakland Athletics attempt to reinvent the structure of a winning ballclub on a minimal budget. The plot moves from one memorable scene to the next, rarely lagging for more than a breath before leaping into the next trade negotiation, lineup confrontation, or affecting father/daughter scene where Pitt humanizes Billy Beane’s priorities. Those priorities, when set against the stakes of multi-million-dollar salaries and a team’s playoff race would appear insignificant, are truthfully the most important aspect of his life. It’s just so damn good!